Starring: Brad Pitt, Jonah Hill, Philip Seymour Hoffman, Robin Wright, Chris Pratt, Stephen Bishop, Reed Diamond, Brent Jennings, Ken Medlock, Tammy Blanchard, Glenn Morshower, Kathryn Morris, Nick Searcy, Jack McGee, Arliss Howard, Spike Jonze. A slow moving, dialogue driven Baseball film – that features very little actual Baseball – will almost certainly ostracise a large amount of viewers. However, this actually works on a surprisingly dramatic level from acclaimed stage director Bennett Miller. 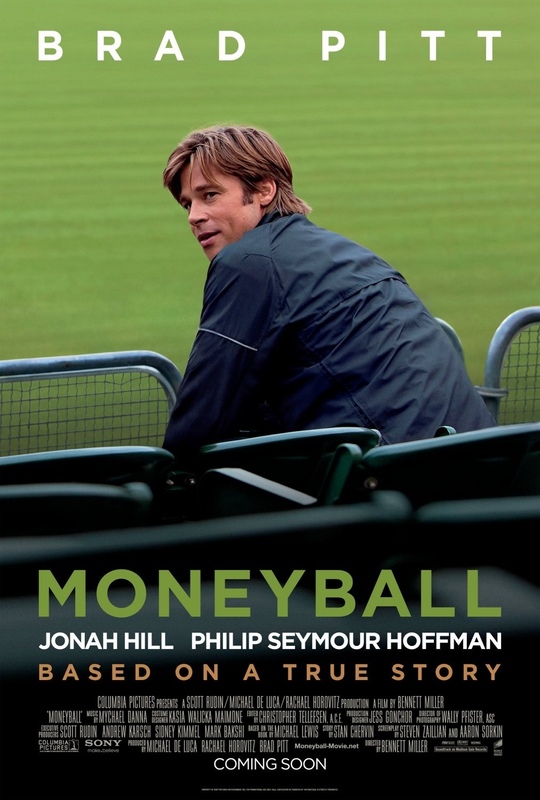 Based on the true story of financially crippled baseball team, the Oakland Athletics and their general manager Billy Beane (Brad Pitt), who tried to hold them all together. In order to make a winning team with no money, he had to change the sport. To do this, he enlisted the help of smart young analyst Peter Brand (Jonah Hill) and attempted to use a new formula of computer-generated analysis to acquire new players. How this film manages to maintain your interest – with constant boardroom discussions and talk of Baseball statistics – is testament to everyone involved. Miller’s direction is low-key, adding an almost documentary feel; Steven Zaillian and Aaron Sorkin’s screenplay is full of natural dialogue and Pitt’s central performance is subtly brilliant. This doesn’t rely on special effects – or even on the game itself that much – to entertain. It relies on a basic story well told. The formula of sports films are left far behind for this fly-on-the-wall approach to the business side of things. There’s no players pointing to the sky before knocking the ball out of the park: there’s no clock ticking as the underdog tries to overcome the big-hitters. Well, in some cases you could say this happens. But it happens less on the park and more in the offices and boardrooms of the backroom staff. This inevitably leads to talking. Lots of talking. But thankfully, the cast are more than up for the challenge. 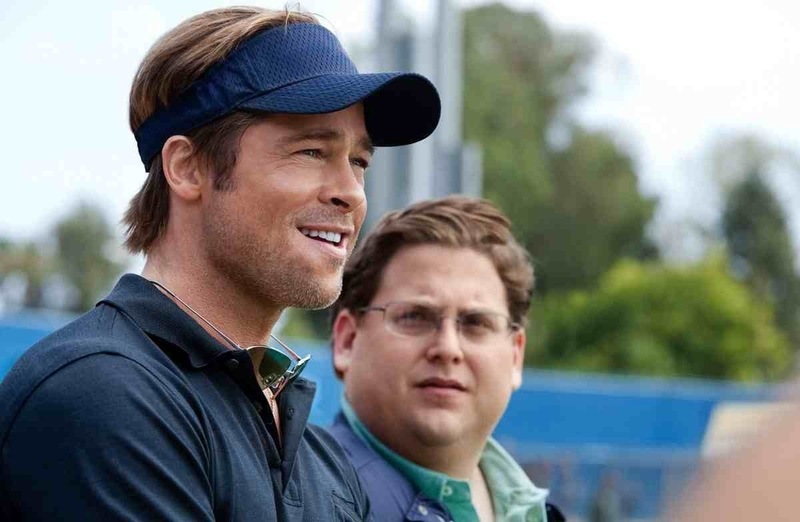 Pitt (in an Oscar nominated turn) is an actor that has grown in the maturity of his recent roles and handles the difficult role of Billy Beane to perfection. The normally profane Jonah Hill (also Oscar nominated) is effectively reserved and even Philip Seymour Hoffman, in a vastly underwritten role, manages to speak a thousand words with his expressions alone. The only downside it had was it’s over-length. At over two hours long, it’s hard to maintain your concentration with a film that is primarily concerned with number crunching. However, most of the time, surprisingly, flys by. An unconventional sports film that focuses on a side of the game that is rarely addressed. In our current financial climate, this has been released at just the right time. This entry was posted on March 11, 2012 at 2:45 pm and is filed under Biography, Drama, Sport with tags 2011. You can follow any responses to this entry through the RSS 2.0 feed. You can leave a response, or trackback from your own site. I hate baseball, so I wasn’t expecting to like this movie, but it was great. Excellent review. Thanks Alec. I’m not big on baseball either. It’s not a sport that gets a lot of coverage where I’m from but it normally works in terms of movies. This was vastly different to any baseball film I’d seen before. I really enjoyed it also. A pretty decent movie but nothing about it made me excited. I don’t know what, but I felt it was missing something. I didn’t expect to like it too much Fernando but I think that’s what worked in my favour. I appreciate natural dialogue and natural acting, of which, I thought this had in abundance. I was surprised. Yeah. What I really appreciated is that a film about sports (especially baseball, which I don’t understand) managed to hold my attention. Besides, it was a good opportunity for Jonah Hill to play against type. He did a wonderful job. I totally agree my friend. I’ve always been a fan of Pitt and Hoffman but Jonah Hill was the biggest surprise in this one. He should play more serious roles. I would like to see what else he’s capable of. By the way, every time I see a photo of him now, he looks different. He’s lost some amount of weight. Do you think he’s maybe trying to open up different options for roles?. I don’t know, hehe. He’s definitely been on a weight rollercoaster lately, haha. He lost a lot of it a few months ago, even getting too skinny. Then he gained some of it back and now, he’s kinda chubby again but no as heavy as he was in films like Superbad. I have no idea if he did it for his career or his health but it doesn’t seem to be working all too well. Let’s hope he gets back on track and his career as a serious actor takes off because he just showed he has the talent. I loved his work in Superbad and knew he was a tremendous comedic actor but it’s nice to see he has dramatic chops as well. A story well told indeed Mark. Nice highlight. Incidentally, in the world of Major League Baseball the Red Sox team has now won 3 championships in the last 10 years using the statistical philosophy used by Beane. According to Forbes magazine, the Yankees who dominated the previous decade employed the same concepts prior to Beane’s adoption of sabermetrics. I enjoy the optimism Beane’s character has getting others to buy in to his vision. Scott Hatteberg: [Responding to being asked to play first base for the Oakland A’s] I’ve only ever played catcher. Thanks again. Good info there. We don’t get much baseball coverage in Scotland but I’ve always been quite interested in the sport. It always makes for a good film experience anyway and I really enjoyed this one. Your review nails it. I thought Pitt’s performance was a subtle revelation and it was really intelligently written. Yeah, I didn’t expect much from it as I thought I’d have to understand Baseball a bit more. As it turns out, this was accessible to everyone. Great performances and very sharply written. I don’t like baseball in the slightest but I liked the way the film was pitched (puns comes free! ha). Hill was impressive too. A real neat turn from someone best known for comedy. Yeah, I was impressed by Hill too. Apparently he’s also great in The Wolf of Wall St as well. Carving out a little dramatic career seems to be working for him. I thought of that when I saw the trailer. The odd actor aside, you need to have range to survive in Hollywood. he really made me laugh in Superbad.